December 1974, Lincoln Nebraska, Federal Court House. 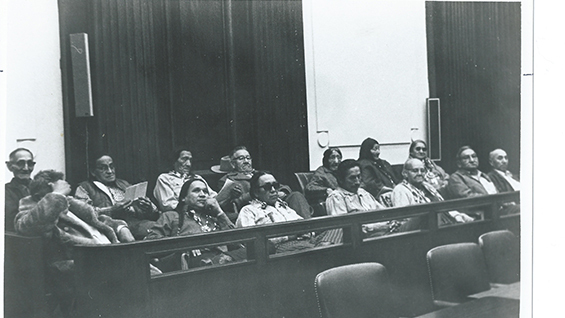 Sioux and Cheyenne elders who presented testimony at a court hearing on the Wounded Knee siege trials of 1973. Roxanne Dunbar-Ortiz gives a free, public lecture as part of the 2018 Fall Intra-Disciplinary Seminar (IDS) lecture series. Roxanne Dunbar-Ortiz grew up in rural Oklahoma. As a veteran of the ‘60s revolution, she has been involved in movements against the Vietnam War and imperialism, union organizing, and was one of the founders of the Wom en's Liberation Movement in the late 1960s. Since 1973, she has worked with indigenous communities for sovereignty and land rights and helped build the international indigenous movement. With a doctorate in history, she is professor emerita at California State University East Bay, and author of numerous scholarly indigenous related books and articles, including Roots of Resistance: A History of Land Tenure in New Mexico and The Great Sioux Nation, as well as a memoir trilogy and the award-winning book, An Indigenous Peoples’ History of the United States. Her most recent book, Loaded: A Disarming History of the Second Amendment, was published by City Lights in 2018.